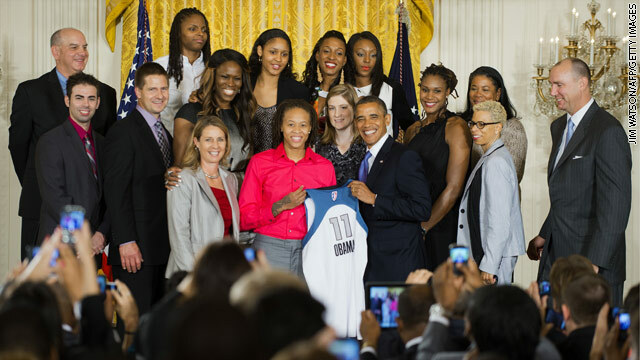 WHITE HOUSE (CNN) – President Obama welcomed WNBA’s Minnesota Lynx to the White House to celebrate their championship season. The Lynx started the 2011 season being one of the worst team in the WNBA but they went on to win the title by beating the Atlanta Dream last October. “This team has come a long way to get here. Just two years ago, the Lynx had the worst record in the WNBA. I’m just saying. But they didn’t let it get them down. They got to work,” the president said. Among the players present at the East Room ceremony were rookie star Maya Moore, veterans Rebekkah Brunson and Lindsay Whalen. Seimone Augustus, the Finals MVP after averaging nearly 25 points a game, presented President Obama with a Lynx jersey with his name on it. The president told the team that he admired the team for all their accomplishments but mainly for being good role models for his daughters. hey obama...nothing better to do eh? A photo opportunity I presume. While everything goes to he## in a hand bag. shutup november2012, you hatter. I dont see whats wrong with recognizing excellence. He is for All Americans. He Cares and that is what he is doing. What's that brown ring around your nose Lionel? At the Democratic convention, Michelle told the fabricated dishonest story of how poor Barack grew up in such poverty. The only thing missing was violins. Now, we know that it was all B.S.. In reality, Barack attended an expensive upscale school in Indonesia ... his grandmother was a vice president of a bank in Hawaii, where he attended an expensive upscale school ... and after that he lived in the expensive upscale part of Chicago, while working and visiting the poor sections, as a community organizer. All this fabricated dishonest B.S. ... and, you gullible Obama stooges embrace it, and blindly defend your 'Dear Leader' ... Obama is a liar, who is destroying America. You Obama stooges, love Obama more than you love America. America is more important than Obama. Obama is expendable and replaceable ... America is not. Save America ... Dump the liar and thief in November !!! i guess all you care is doing nothing as well? why not be productive and do some research on what your president did for your country? At least your president is working on appreciating others who work hard and also doing his job.. I guess you are the 47% who takes advantage of the government allowance and them whine about President obama's effort... gosh.. The arrogant egotist, Barack Obama, disrespected America, and the American flag today, by inserting his ugly campaign logo in place of the stars. When I saw it on the news, I nearly threw up. Who does this two bit community organizer upstart think he is ??? For over 235 years, real patriots have died for our flag, and this vain fool just pisses on our history and our traditions. Save America ... Dump the liar and thief in November. But remember they did build that – the govt did. Obama Cares, Obama Cares, Obama Cares. The arrogant egotist, Barack Obama, disrespected America, and the American flag today, by inserting his ugly campaign logo in place of the stars. When I saw it on the news, I nearly threw up. Who does this two bit community organizer upstart think he is ??? For over 235 years, real patriots have died for our flag, and this vain fool just defecates all over our history and our traditions. Save America ... Dump the liar and thief in November. You thank Obama for 'good sportsmanship' ... this guy is a coward, and a bully, who only competes when he has an unfair advantage ... whether it's his senatorial campaign, where he disqualified his opponent (a Black Female) on a technicality ... or, when he humiliated his opponents (the Supreme court & Paul Ryan) on national TV, when they couldn't respond ... or, when he has the main stream media protecting him over his opponents, at a ratio of 20 to 1. It's not the kool aid it's the confidence that to date Mr President has shown his courage and ability to make good decisions in the face of stressful times. Can we say for the same flip flopper? Put Robme in a new surrounding or under stress and he blows it. Someone is wrapped to tight. 400,000 children in Obama's home town finally started school today. Still no questions from the press or word on Obama's evolving opinion on the matter. Apparently it's either a no win situation for him to mention it or he doesn't care. What else it could be? What??? No pictures with any teachers or school children.